Bread bakers are a very passionate bunch. The passion can become obsessive, particularly once you get into baking with wild yeast and slowly reach that snobbish point of view that baking with commercial yeast is “for sissies.” Granted, I am not that snobbish, but I admit that once you start down the wild path, it’s hard to turn back. The flavor of bread leavened with wild yeast is more complex, and the whole process a lot more elusive, therefore so much more fun! Some days your bread will be spectacular, others not so much, even when everything seems to be the same. Last month I stumbled onto this post by a super passionate baker named Maurizio. 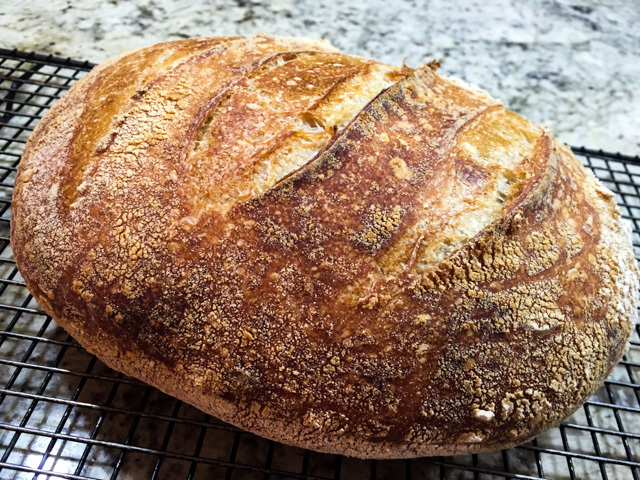 Of course, a post entitled My Best Sourdough Recipe got my attention right away, and what I found inside was a very detailed picture-loaded tutorial of the making and baking of a superb sourdough loaf. 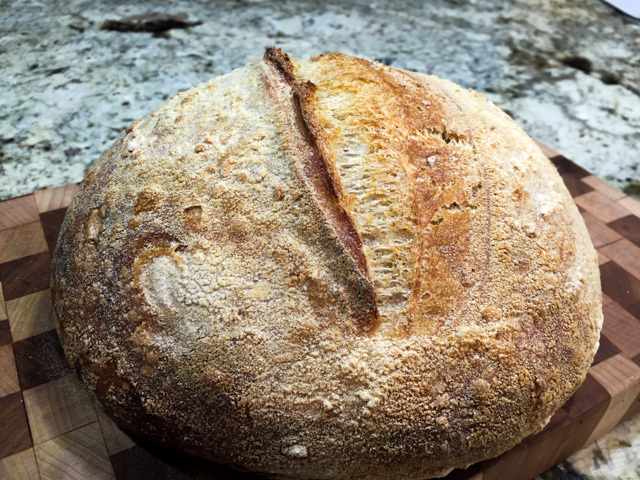 If you are new to bread baking, then dive into his article, read it carefully, and go to work. I am sharing with you just the basic recipe, but insist that you should visit his site for the full details. He’s got a ton of great bread recipes! In fact, just as I type this post, I have another recipe from his site undergoing its bulk proof. One hint: it has walnuts… Are you in love yet? What if I say it has a particularly tasty dry fruit too? Build the liquid levain 10 to 12 hours before you want to make your final dough. Leave it at room temperature (around 72 F). Next morning, mix flour and 350 g of water very well in a bowl and cover. Ensure all dry flour is hydrated. Leave it to autolyse for 1 hour. Add the levain with the reserved water and hand-mix it into the dough until it is very well incorporated. Leave it 30 minutes at room temperature, or if you have a proofer, set it to 78 F and keep the dough at this temperature all the way through. After 30 minutes, add the salt, and mix well. After the salt is incorporated perform folds for about 2-3 minutes in the bowl. Grab under one side, pull up and over to the other side, then rotate the bowl a bit and repeat. Do this about 30 times or so (it goes fast and easy). At the end the dough should still be shaggy, but it will be a little more smooth and will slightly start to hold itself together more in the bowl. Now you are ready to start bulk fermentation. If your home is at 78 to 82 F, bulk fermentation should last 4 hours. During fermentation, do 6 sets of stretch and folds, the first three at 15 minute intervals (it will take you to 45 minutes of bulk fermentation), the last three at 45 minute intervals (by the time you do the last one you will be at 3 hours, with a final hour in which the dough is left undisturbed). If your dough is too “weak”, seeming to lack structure, add one more cycle of folding after 30 minutes and leave the dough undisturbed for another hour. Lightly shape the dough into a round, cover with inverted bowl or moist towel, and let rest for 20 minutes. After 20 minutes remove the towel or bowl and let the dough rest 5 more minutes exposed to air. This step helps dry out the dough just a bit so it’s not too sticky during shaping. Lightly flour the top of your dough rounds and flour the work surface. Shape into a batard or boule. Place in a banneton very well floured, leave it at room temperature for about 20 minutes, then retard in the refrigerator for 15-16 hours. Heat oven at 500ºF. Bake 20 minutes at 500ºF with steam, and an additional 25-35 minutes at 450ºF, until done to your liking. Cool completely on a rack before slicing. That loaf traveled all the way with us to Colorado, and made our first evening in Silverthorne quite special… nothing like a nice loaf of bread to make you feel home and cozy…. So, is it the best sourdough recipe ever? I think the best bread recipes are the ones that work consistently and fit your schedule well. It also helps to have a method that is easy to follow, so that by the time you make it for the third or fourth time, it becomes second nature. I don’t have the exact same flours Maurizio used, so every time I baked this bread I felt that as written the formula had a tad too much water. It was hard – for my level of technique with the folding – to obtain good gluten structure. Once I held back a little of the water the dough turned out perfect, it had more “muscle”, which ultimately gives a better oven spring and crumb structure. You will have to play with it a little. I published the recipe the way it worked best for me. The schedule is perfect for my style of baking. I can start mixing the dough early in the morning on a Saturday or Sunday, by 3pm maximum it is in the fridge and I don’t need to think about it until next day. I am usually up at 5am, so I can turn the oven on and have the bread ready before it’s time to go to work, if I made the dough on a Sunday. So, all things considered, it is a GREAT recipe that I intend to use often and play with to add goodies to the dough. Walnuts, seeds, cheese, olives, herbs… you just wait and see! Your bread is gorgeous! I love the rhythm of baking sourdough bread too. Such fun. Your crumb in this loaf is stunning. hope you are headed to a great weekend in CA! the water that you add with the levain is the little bit you reserve before making the dough – Maurizio doesn’t add the whole amount of water from the get go, it is one of the nuances of is method which is quite interesting and makes it easier to mix everything more homogeneously… I hope you try it! thank you, I understand now. 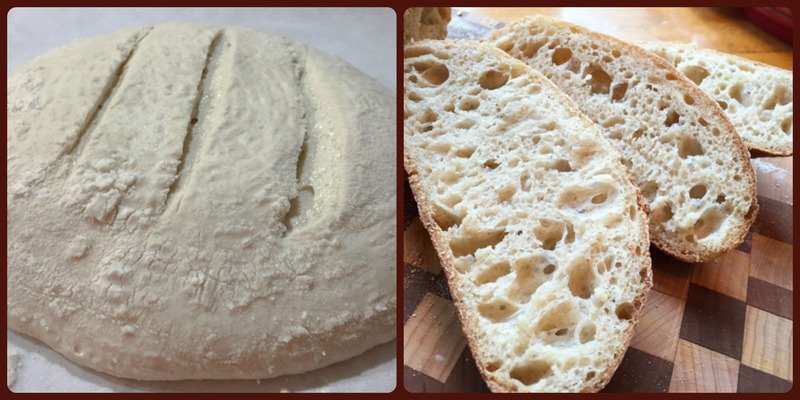 I usually make my Levain by adding the same amount of flour and water to the starter. Since I started making sourdough we seem to only want to eat sourdough types. Oh, the fascination of sourdough, love it. I wish I could stick my nose in your bread!!! It is a beautiful loaf, I follow Maurizio and am so impressed with his sourdough skills, it’s very technical and the outcome is sheer perfection. Your loaf looks perfect, the crisp crust and gorgeous crumb. I do love making sourdough and one day will see if I can master this recipe. I am also very impressed by his breads, so many, and each post a complete tutorial with great photos.. I want to make his latest ones, a rye bread baked in a Pullman type pan – I just know it will be amazing! Beautiful loaf! I haven’t baked a good loaf of sourdough in forever! I might just use this to get back in the swing of things! Indeed… bread is a wonderful thing to make at home… plus, the ability to freeze it makes it possible to have amazing bread at short notice… I love it! Sally, I notice that .I realize that yours makes one loaf, while his makes two. I’m interested why you don’t put in the water in the levain, Marizio puts it in his. Is there a reason for this? I pretty much halved the recipe, because I find that making two loaves is too much for us. As it is, I already have 75% of that bread frozen in slices… it will take a while for us to go through it. Also maybe because Maurizio used a different flour, I had to change the recipe a little bit because it was way too liquid for me. First time I made it (I did not blog on it), the bread lacked structure I just could not fold it into submission 😉 So I decided to change the amount and the way to add the water to the dough. I think that maybe you could follow Maurizio’s method exactly as he did, and see how it works for you, then maybe adjust slightly… hope this helps!